metaldude29 | MSRcast and Metal Geeks Unite! Months ago while sitting in the theater awaiting the movie I came to see, I was hit by the Looper trailer. As the trailer ended all I remember is wanting to see more because I am a sucker for a good time travel movie. 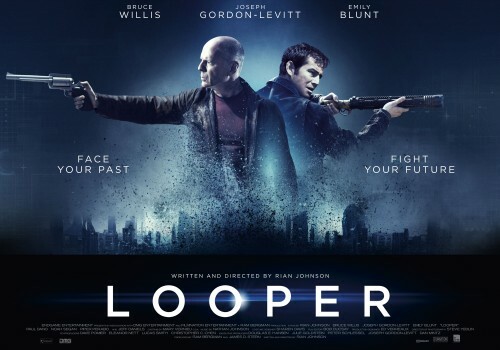 After watching I will tell you now Looper doesn’t disappoint. It has action, drama, thrills and a tiny bit of romance. In a mere 62 years from now time travel exists, but it’s illegal. That does not stop the mob from sending people they want murdered back to the past (2044), to assassins nicknamed “Loopers” that stand ready at a designated spot and time to shoot the victims as soon as they appear. The Loopers are paid with silver bars that arrive strapped on the bodies in which they spend on vehicles,clothes,drugs and women. Joseph Gordon-Levitt plays Joe, when younger is recruited by Abe (Jeff Daniels) who was sent back in time to manage the Loopers.Joe is living the high life in a dismal looking future America,saving up his earnings so he can one day retire to France. Complications occur when a new unseen mob boss named the Rainmaker starts sending back the Looper’s future selves to kill which is called “closing the loop”. So when the time comes when Joe goes to assassinate the next target only to find out it is his future self (Willis) he hesitates to pull the trigger giving future Joe a chance to escape. Future Joe has a agenda of his own. To track down down and kill the Rainmaker who is now a child and change an event that is tragic to him in the future all while trying to avoid Abe and his mob. Young Joe, also on the run from Abe, ends up at a farmhouse where he meets Sara (Emily Blunt) and her son Cid, who is definitely special ( do NOT get Cid angry). There are more twists and turns than this so I won’t spoil the ending. This is the second time that writer-director Rian Johnson and Gordon-Levitt have teamed up. The 1st being the 2006 “Brick” which I enjoyed.I am now looking forward to watch his 2nd movie”The Brothers Bloom” which is next in my Netflix queue. Gordon-Levitt, Willis and Daniels give superb performances.The story is well-constructed with a few minor flaws. I would love to see the Looper universe get a series or a comic book series to explore more story lines. So do yourself a favor, geek out and see this movie. As of now it’s on my Top 10 movies of the year. Welcome to the future. Welcome to the wasteland that is America. Welcome to Mega City 1, a metropolis that spans from Boston to Washington D.C. A city with a population of 800 million, where over 17,000 crimes are reported daily with only “judges” to try to clean up the streets..
Now I went to this movie with the bad taste of the 1995 movie still in my mouth (mostly from Rob Schneider) but eager to see what director Pete Travis had to offer in regard the 1977 British hero made famous by John Wagner. I walked out wanting more and hoping down the line there will be a sequel. The story starts with Judge Dredd (Karl Urban), the feared, gritty, ruthless judge, jury and executioner patrolling the streets with his “Lawmaster” motorbike and doing what he does best: chasing down criminals and dispensing judgement. Dredd comes to realize there is a new drug on the streets called Slo-Mo, which gives the illusion of slowing down time. The special effects and the 3D element heighten the scenes of junkies when using Slo-Mo and when the thugs try to have a shoot out with Dredd while still on the high of Slo-Mo. Dredd is called to the Hall of Justice to break in a rookie, a mutant psychic named Cassandra Anderson (Olivia Thirlby). Their 1st assignment is to investigate a triple homicide in the Peach Trees tower. The tower is ruled by a prostitute-turned-drug lord named Ma-Ma (Lena Headey) and her clan of thugs and junkies. All hell breaks loose when Ma-Ma puts the tower in lock-down and sends her gang to kill Dredd and Anderson. I won’t spoil the whole story, but I was satisfied when the brutality and violence kicked in, and let me tell you, the bullets and the body count are aplenty. Some people have already compared this film to a movie that came out earlier this year, The Raid:Redemption. Both movies take place mostly in a tower, and in both movies the hero has to go through the thugs in the tower to get to the big boss. The Raid:Redemption has a lot choreographed martial art filmed fights while Judge Dredd lets his “lawgiver” pistol do all of the action. I enjoyed both movies. The Raid:Redemption is out on DVD if you want to compare them. 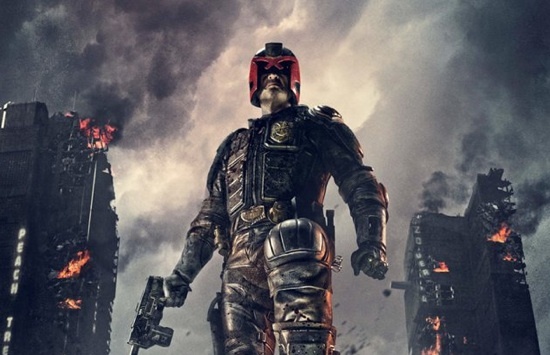 In my geek opinion, I thought Karl Urban did a good job as Dredd, tough and sneering. Fans of the comics will be happy to know Dredd never takes his helmet off, which was a big no-no in the 1995 movie. Lena Headey was great as the sadistic, take-no-prisoners Ma-Ma. I would love a 3rd movie to explore more of Mega City 1, more story-lines, and to have more Dredd.